Our Single IRB solution provides a proven IRB infrastructure that adheres to the highest standards to ensure regulatory compliance while offering customer support that exceeds client expectations. 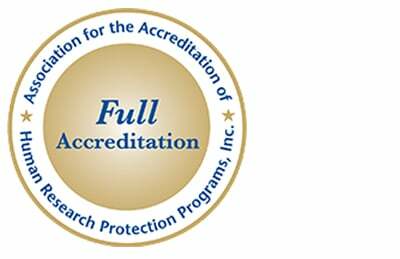 Our fully AAHRPP accredited Single IRB (sIRB) supports organizations seeking an IRB solution that facilitates compliance with the NIH Policy on the Use of a Single Institutional Review Board for Multi-Site Research. We also have over 20 years of experience as an IRB for multi-site and local research studies. We can help ensure that IRB reliance agreements are in place with all sites relying on our IRB for review. Additionally, our IRB is among the organizations that have joined SMART IRB and we can utilize the SMART IRB Agreement to facilitate IRB reliance between our IRB and institutions. Our IRB team is also solutions oriented and committed to working with clients to ensure their research studies can be executed in a way the helps them meet their goals and comply with regulatory requirements. We understand that institutions need to stay connected to all their studies and oversee their entire research program. Our Connected IRB Model helps maintain this connection by promoting communication with key stakeholders. This includes email alerts for investigators and research coordinators as well as specific alerts for critical trial concerns such as unanticipated problems involving risks to subjects or others. Many of our IRB committee members are from leading academic medical centers. Plus, our experienced IRB Administrators manage the process. Your team will also be given access to IRBManager™ for online study submission and management.